Last night I had nothing to do so I decided to make the trip to Nationals Park to watch some baseball. It didn’t figure to be that exciting of a game. The Cubs are one of baseball’s worst teams this year, coming into last night’s game at 35-53, losers of five of the past six games. The Nationals, on the other hand, have been playing very good and exciting baseball, winning 15 of their last 18 games heading into last night. The Nationals were starting 36-year old Livan Hernandez, who is having a good year (19 starts, 5-8, 4.01 ERA, 121.1 innings, 1.368 WHIP), but who is also not part of the new, young and exciting generation of pitchers who throw in the high-90s with knee-buckling movement on all of their secondary pitches. His fastball barely touches 85 mph. He is throwing it at an average speed of 83.8 mph this season. He throws a slider and a changeup in the 76-78 mph range and a SLOW curveball at about 66 mph. Opposing Hernandez was 27-year old Matt Garza. Garza can probably be placed in the beginning of the new era of pitchers. Once rated the No. 21 prospect in the minors by Baseball America, Garza possesses a killer arsenal of pitches, but has never quite been able to put it all together on the mound. In six big league seasons, Garza is 46-51 with a 4.00 ERA, 1.318 WHIP and a 2.32 strikeout-to-walk ratio. Those numbers are not horrible, but for a guy who can touch 97 mph (average speed: 93.8 mph) on the radar gun with his fastball and then possesses a slider, curveball and changeup, all of which can dance across the plate, it is a little disappointing. There is a reason that the talented Garza is now on his third team in six years: He has never quite been able to live up to his immense potential. After two shutout innings, Garza morphed into a completely different pitcher when he came out for the third. He gave up a leadoff single to Hernandez. Then Roger Bernadina roped a double to right field. Danny Espinosa followed by knocking in both Hernandez and Bernadina with an RBI single to put Washington up 2-0. Ryan Zimmerman hit a nubber down the third base line, beat it out for a single, but then Garza threw the ball into the stands. Michael Morse then singled to center, knocking in Espinosa. Jayson Werth knocked in Zimmerman with an infield single to second and then Carlos Pena committed an error that loaded the bases. Wilson Ramos then smashed a double down the line, knocking in two more runs to make it 6-0, and that was it for Garza. He allowed seven hits in the third without recording an out. The Nationals would add one more that inning against Jeff Samardzija on a Bernadina RBI single to make it 7-0. Chicago went down quietly in the top of the fourth before Rick Ankiel clubbed a double off the right field fence to make it 8-0 Washington in the bottom frame. With the big lead, the Nationals looked like they had it in the bag. Hernandez was cruising along and the Nationals bullpen, one of the best in baseball, was waiting out in right field just in case things got chippy. 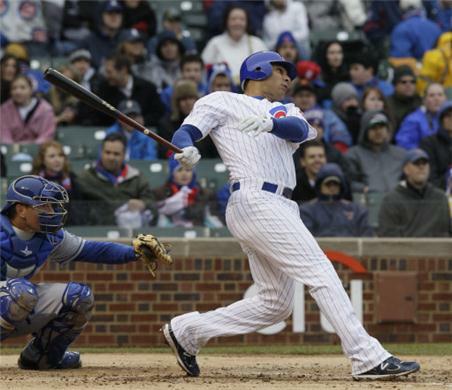 In the top of the sixth, Hernandez got Starlin Castro to groundout to second. Aramis Ramirez followed with a single. Hernandez then struck out Pena swinging. With two outs and a runner on first, the score still 8-0, it was Livan Hernandez’s turn to implode. Geovany Soto singled to center. Marlon Byrd then singled to load the bases. Alfonso Soriano scored Ramirez with an RBI single to left. Darwin Barney then crushed a pitch into the gap in right-center to score Soto and Byrd. With the score 8-3 and runners on second and third, Cubs manager Mike Quade turned to Blake DeWitt to pinch-hit. DeWitt turned on a Hernandez pitch, sending it right down the right-field line. The ball would hit high off the foul ball, making it now 8-6 in favor of Washington. 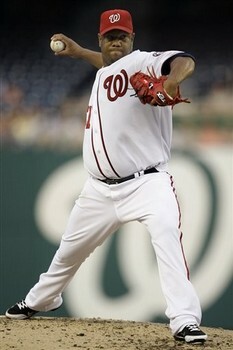 Hernandez, after allowing five consecutive hits, was sent to the showers and the vaunted Nationals bullpen went to work. Todd Coffey relieved Hernandez and retired Kosuke Fukudome on a lineout to center to finally end the top of the sixth. In the top of the seventh, Coffey got Castro to line out to left to leadoff the inning. He would follow by walking Ramirez. With the left-hand hitting Pena coming up to the plate, Nationals manager Davey Johnson elected to bring in southpaw Sean Burnett. It did not take long before this move backfired. Burnett threw one pitch. Pena launched it into the right field bleachers to tie the game. Just like that, the Nationals had blown an 8-0 lead. Things began to get really interesting here. Sean Marshall came out of the bullpen for Chicago and retired the side in order in the bottom of the seventh. With the game tied at eight in the top of the eighth, Washington turned to the laser-throwing Henry Rodriguez. Rodriguez hit 100 on the radar gun with almost every fastball and threw a slider where the bottom just seemed to fall out. He struck out Reed Johnson before Fukudome grounded out weakly to second. With two outs, Castro lined a double into right-center field to set up the first of many high-pressure, late-inning situations of the night. Runner on second base, two outs and Ramirez coming to the plate. Ramirez worked the count full before lining a single into right-center field to score Castro and give the Cubs their first lead of the game at 9-8. The Cubs stuck with Marshall for the bottom of the eighth. Bernadina led off with a single. Espinosa tried to bunt him over, fouling off both bunt attempts before striking out. The Nationals didn’t fool around bunting anymore with their best hitter coming to the plate. Bernadina stole second on the first pitch before Zimmerman eventually grounded out to second, moving Bernadina to third. With two outs, Michael Morse stepped up to the plate. There have been few hitters in baseball who have been hotter than Morse. In 51 games since May 8, Morse is hitting .335/.389/.682 with 15 doubles, 13 home runs and 37 RBIs. On the first pitch, Morse hit a hard groundball through the middle of the infield to knock in Bernadina and tie the game at nine. Marshall retired Werth to end the inning, but as things headed to the ninth, the game took on an extra-innings feel. Naturally, in a game that felt like it was going to extra innings, the Cubs scored the very next inning to put that in jeopardy. Tony Campana reached on a fielder’s choice with two outs and then stole second on the first pitch to Barney. Barney worked the count to 3-1, then smashed a pitch to his liking for a double down the right field line to give the Cubs the lead again, 10-9. The Nationals, who had won nine straight one-run games at home, were not going to go down without a fight. 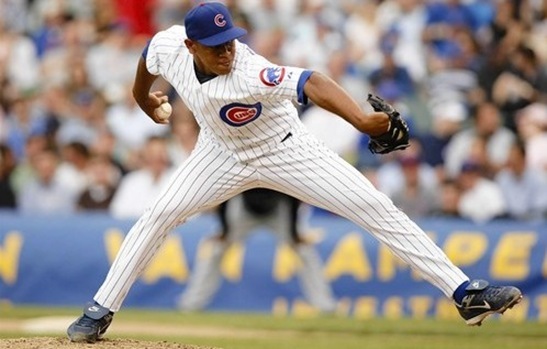 Chicago brought in their closer, Carlos Marmol, who promptly hit Ankiel to lead off the inning. Ramos then bunted Ankiel over to second base. With the struggling Ian Desmond due up, Davey Johnson elected to send up 43-year old Matt Stairs. Marmol threw the first pitch to the backstop and Ankiel went to third base. The Cubs brought the infield in. All Stairs needed to do now was loft a flyball to the outfield or hit a groundball through Chicago’s drawn-in infield to tie the game and guarantee extra innings. Instead, Stairs hit a weak pop-up in foul ground down the third base line. Ramirez caught it for the second out. Now Rodriguez was due up, but Johnson decided to send up the dangerous Laynce Nix. Marmol wanted no part of Nix, throwing a 3-0 slider nowhere close to the strike zone to walk Nix on four pitches. The Nationals had runners on the corners with two outs and Bernadina coming to the plate. Alex Cora pinch-ran for Nix and stole second base, giving Washington two runners in scoring position with two outs. Bernadina already had two hits on the evening. Marmol got the count to 0-2 before throwing a fastball high. With the 1-2 pitch, Bernadina lofted a flyball to right field to end the game and give Chicago a wild, 10-9 victory. Last night’s Cubs-Nationals game might be the best game I have ever been to. The great thing about baseball is a game that doesn’t look exciting on the surface turns into a classic. An 8-0 blowout turns into an unbelievable comeback, which turns into a seesaw battle in the late innings. You never know what you will see at a baseball game. However, more often than not, a warm summer night at the ballpark turns into something you will never forget. This entry was posted on July 8, 2011 by Scott Kornberg. It was filed under Chicago Cubs, Washington Nationals and was tagged with Aramis Ramirez, Carlos Marmol, Carlos Pena, Chicago Cubs, Danny Espinosa, Darwin Barney, Davey Johnson, Jayson Werth, Livan Hernandez, Matt Garza, Matt Stairs, Michael Morse, Mike Quade, Rick Ankiel, Roger Bernadina, Ryan Zimmerman, Scott Kornberg, Sean Burnett, Sean Marshall, Starlin Castro, Washington Nationals.